Did you know that December 6th is Saint Nicholas Day? Many cultures celebrate by leaving their shoes out on the night of December 5th and St. Nicholas comes and leaves treats like coins, nuts, fruit, and candies. 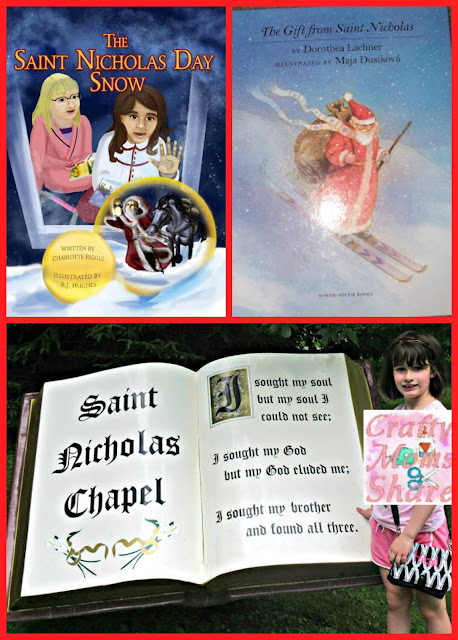 This is all in memory of the real St. Nicholas and how he gave so much to others. 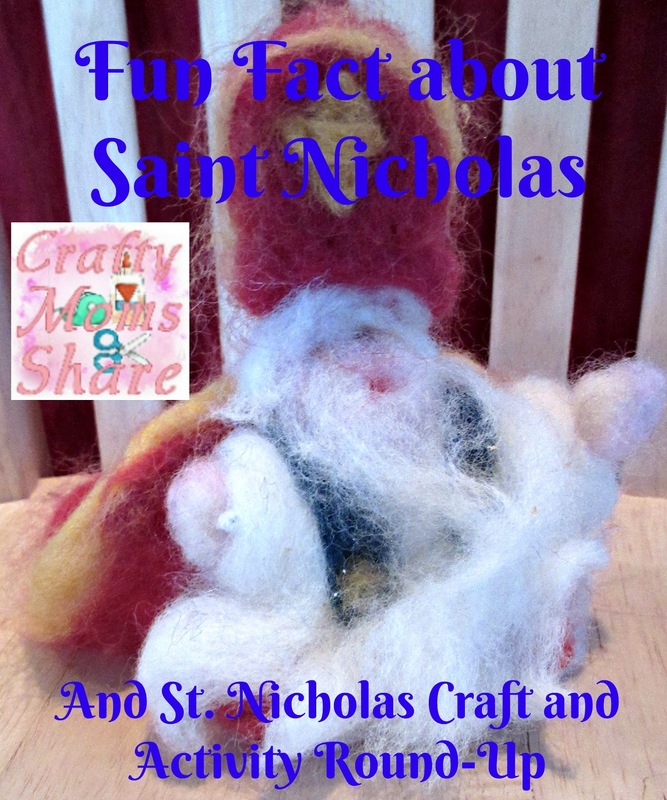 I thought to celebrate this year we would look at some fun facts about this saint. 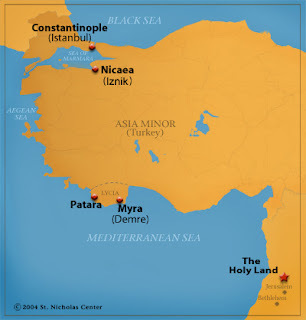 Nicholas was born in 270 A.D. in Patara and served as Bishop of Myra. Both are seaports off Turkey’s southern coast. He died in 345. His remains ended up in Bari, Italy. Though some were left after his tomb in Myra was invaded and those now are enshrined in the church of St. Nicholas on the Ludo in Venice, Italy. Nicholas’s parents served the sick when Nicholas was born. They contracted the diseases and died. He inherited everything since he was an only child. Many consider him the first philanthropist saint. It is legend that his first philanthropist act happened in his hometown. There was a widower father with three daughters who was considering selling them into slavery out of dire need. Nicholas threw a bag of gold threw their window three consecutive nights. He became Bishop of Myra at the age of 30 and is sometimes referred to as the boy bishop because of the young age. He was one of the 318 bishops who participated in the Council of Nicaea in 325 A.D. It was here that the Nicene Creed was written. There are records of Nicholas’s giving help. He is considered the protector of the innocent. One includes going up to the executioner and taking the sword from his hands and throwing it on the ground to save three supposedly innocent men from death. Inspired by St. Nicholas French nuns during the Middle Ages started a tradition of bringing anonymous gifts to needy families and their children on December 5th (St. Nicholas Eve). Families would wake up to the surprises and when they tried to find out who was the benefactor they were told it must have been St. Nicholas. Oranges are often a gift of St. Nicholas to represent the bags of gold thrown in the neighbor’s window. St. Nicholas spent seven years imprisoned and tortured for his faith in Christ before the first Christian emperor, Constantine issued the Edict of Milan in 313 A.D. giving liberty to all Christians. It is believed that the Emperor of Constantinople’s niece, Princess Theophano bought a mosaic icon of St. Nicholas for her future husband, Emperor Otto II as a wedding gift. They were married by Pope John XIII on April 14, 973 in old St. Peter’s Basilica Rome. Nicholas made the pilgrimage to the Holy Land in 312 A.D. He lived in caves near Bethlehem for three years and did some writing that has been lost. It is believed that his relics release a rose scented liquid called manna and has miraculous healing powers. Clergymen still go to a sarcophagus in the Basilica San Nicola church on December 6th each year to procure it. 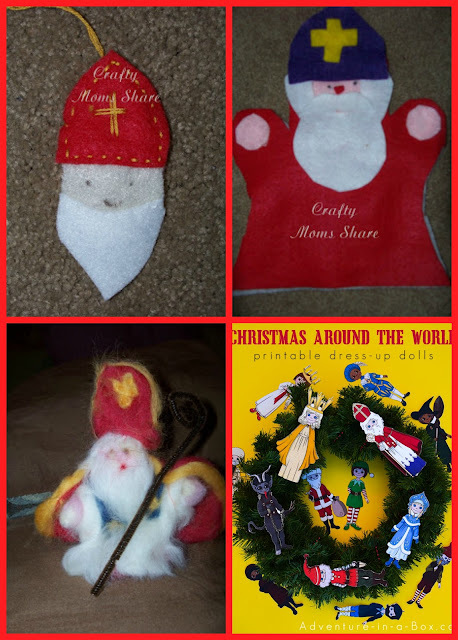 Some bloggers shared more Santa crafts rather than St. Nicholas. By adding a cross maybe to some of the hats however these could be turned into Saint Nicholas.